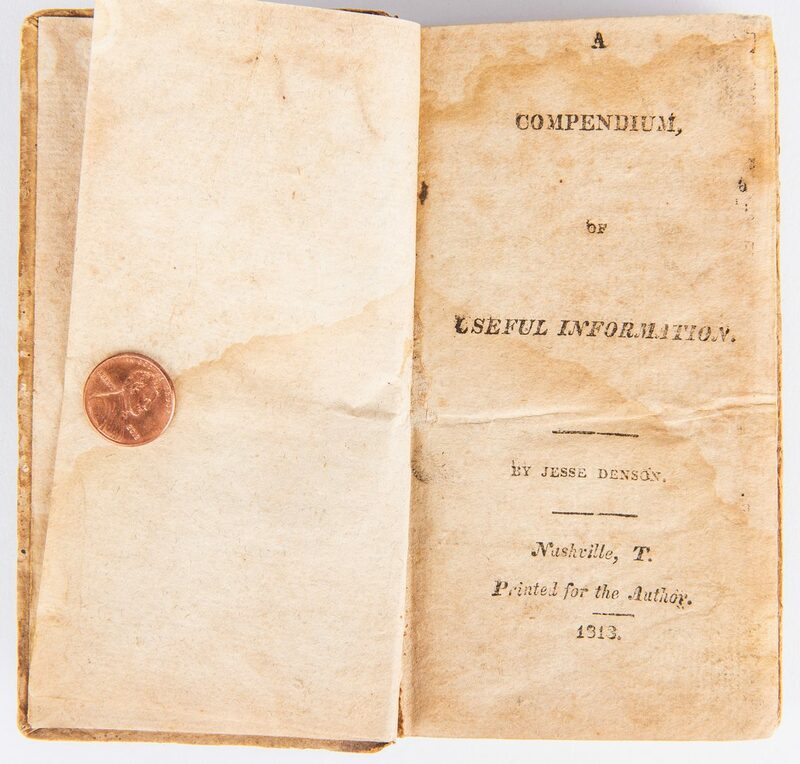 A Compendium of Useful Information by Jesse Denson, 1813. 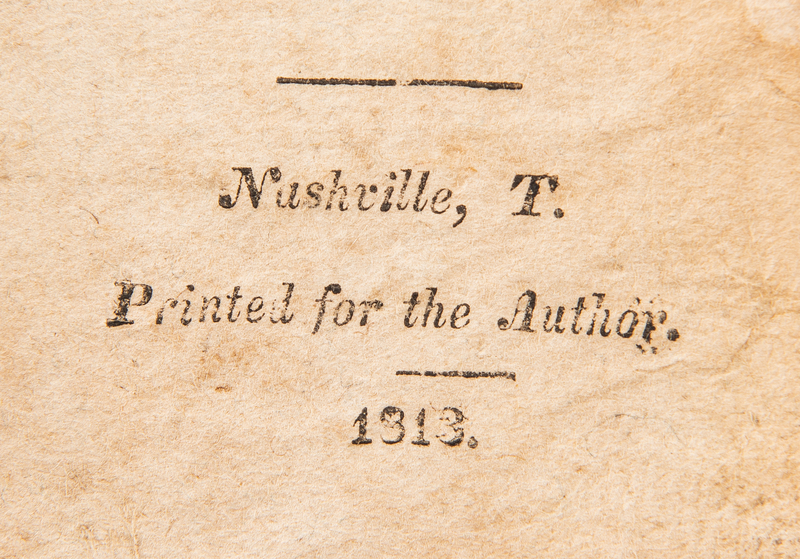 Printed for the author, Nashville, Tennessee. 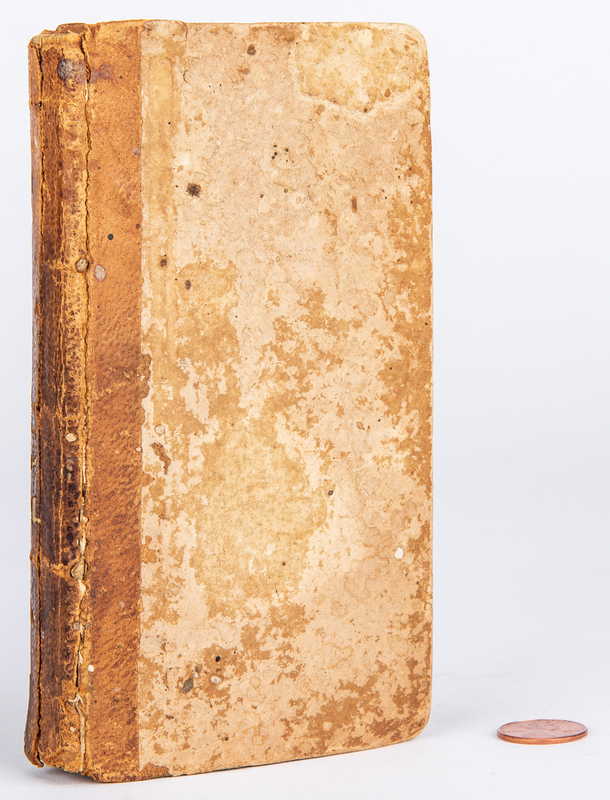 236 pages including a "To the Reader" introduction page by Denson and table of contents, hardbound one quarter leather binding to spine. 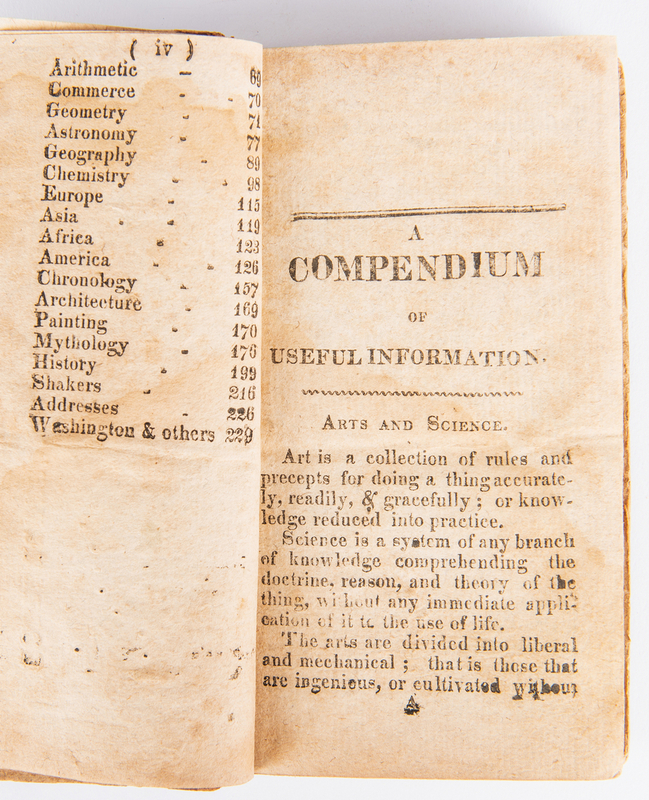 The book covers wide variety of topics including Arts and Sciences, Aurora Borealis, Government, Mathematics, chapters discussing the different continents, Mythology, and Washington and others. 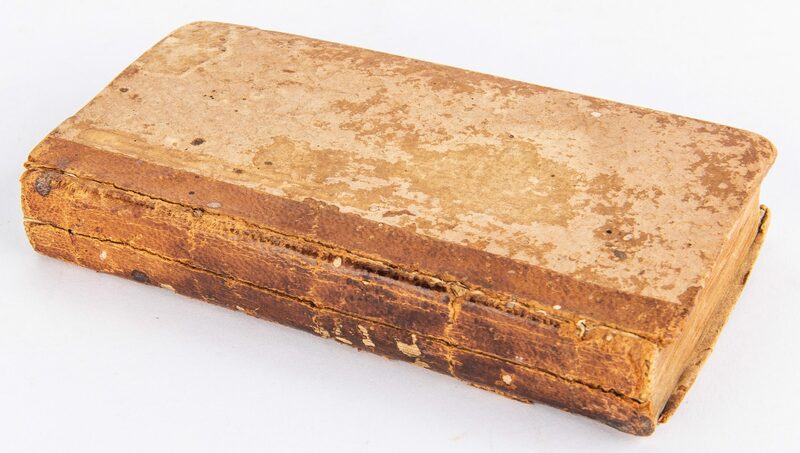 6" H x 3 3/8" W x 1 1/8" D. Biography: Born in Anson Co., North Carolina, Jesse "The Scribe" Denson moved to Stewart Co., Tennessee by 1804, with his brother Nathaniel and others from Anson Co., NC. He served as Sheriff of Stewart Co. TN- 1809/1810. He built a grist mill on Long Creek, 4 miles from Cumberland River. Served with General Jackson in the Creek Campaign and battles of the War of 1812 against the British. Served as Paymaster on the Creek expedition, also served as Secretary to Jackson and Chaplin. Enlistments: Oct 4, 1813 Paymaster in 1st Reg of Tenn. under Col. John Wayne; Jan 18, 1814 Quartermaster Sgt. under Maj. Thomas Williamson; April 16, 1814 Private in Col. John Miller's Reg. of Spies (Scouts). Petition before Congress for aid to Elder Denson found in National Archives, signed by: John Quincy Adams, Gen. Lafayette, Andrew Jackson, James Monroe, J. C. Calhoun, Wm. H. Crawford, James Madison. These people pledged money. Another petition for bounty land had two pages of signatures and recommended he be given bounty land, dated Feb. 1825. He went to Texas, petitioned Stephen F. Austin for land in the 2nd Colony and received a league of land on Spring Creek, granted May 4, 1831. He land was the farthest west, bounded by Samuel McCurley. In 1834 he sold this land to Elisha Roberts and returned to Rankin Co. MS. He married Ann M. A. Hutchins in Rankin Co. on 16th March 1836. He wrote two books, published in Nashville. 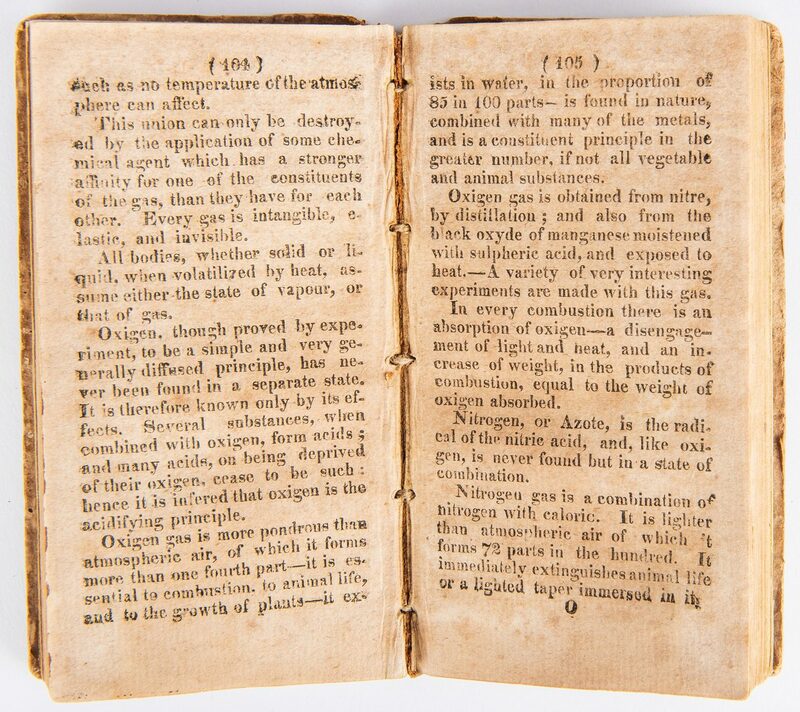 The first was an allegory about his experiences in the Creek campaign,and the second "A Compendium of Useful Information", contains chapters on Art, Theology, Logic, Grammar, and many more topics. Both books are in the TN State Archives. 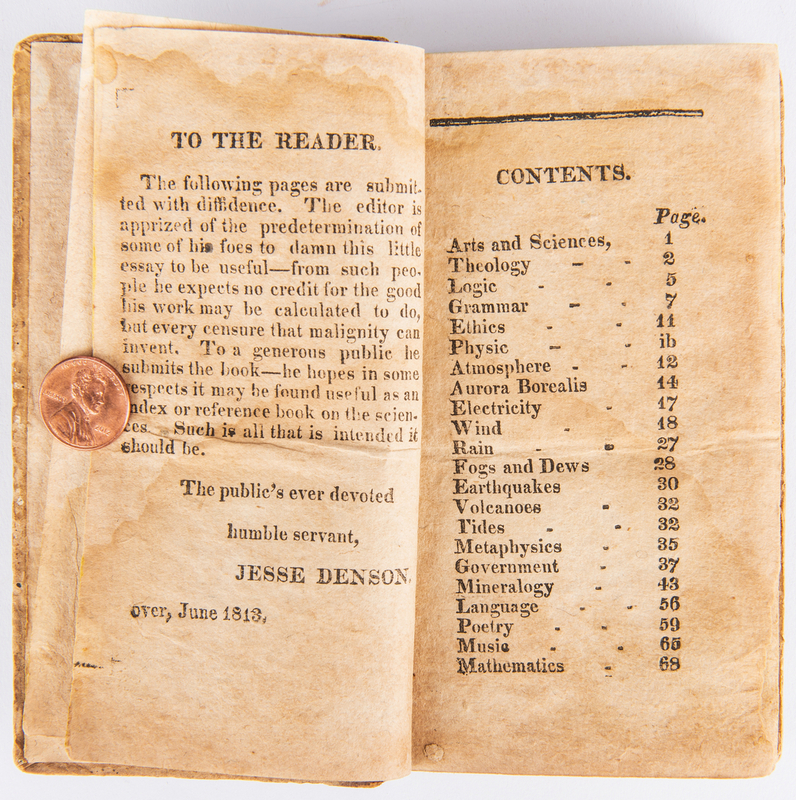 The books show that Jesse Denson was an educated, highly intelligent man. 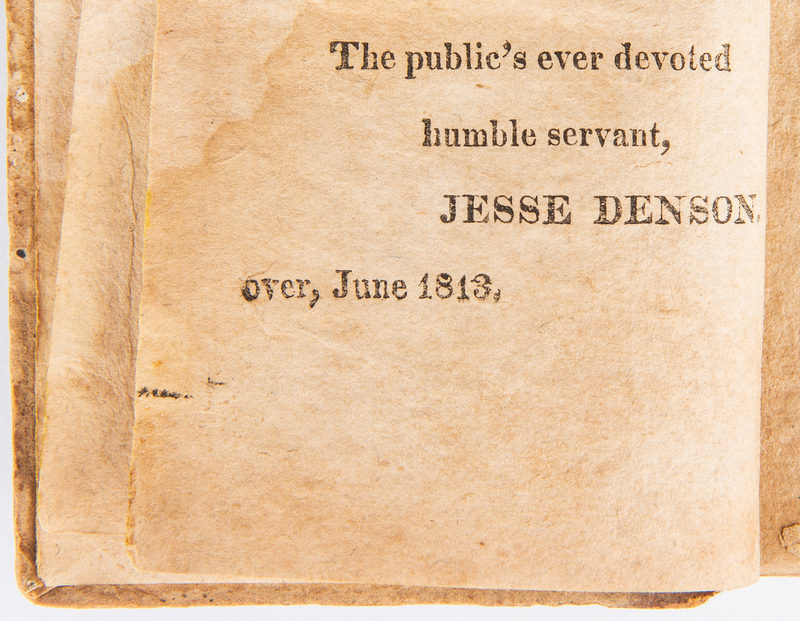 A deed in Rankin Co., Mississippi between William Denson and Ezekiel Adams dated May 13, 1835, is witnessed by Jesse Denson and Eliza Denson. He passed away on July 29, 1841 (aged 96-97) in Pisgah, Rankin County, Mississippi, and is buried in Pisgah Cemetery. (source: https://www.findagrave.com/memorial/16287898/jesse-denson). Provenance: The collection of internationally known ragtime pianist and music historian Johnny Maddox, Gallatin, TN. 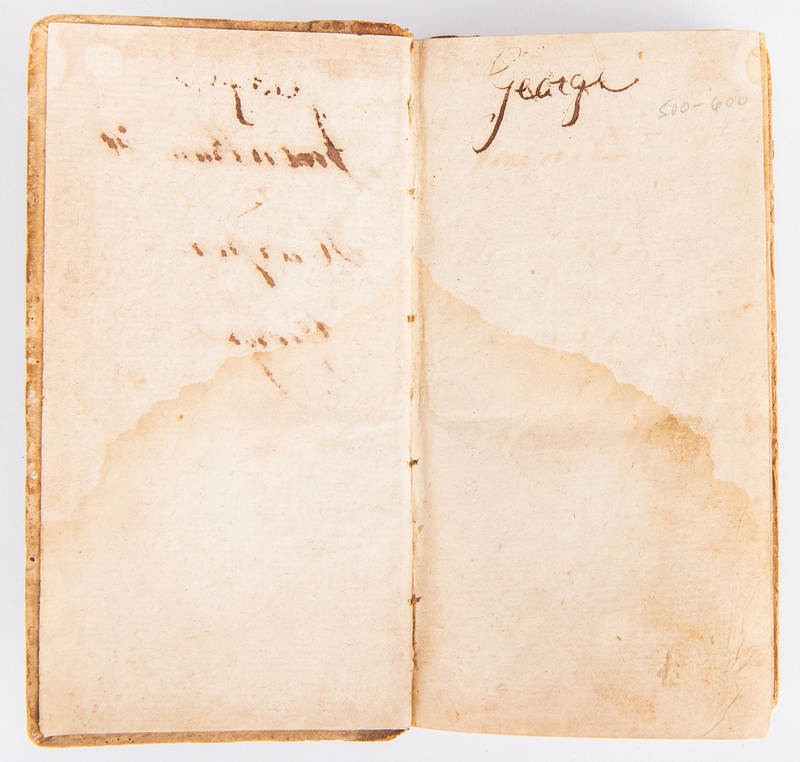 CONDITION: Overall good condition with wear to covers and foxing, areas of dampstaining, to pages to be expected from age. 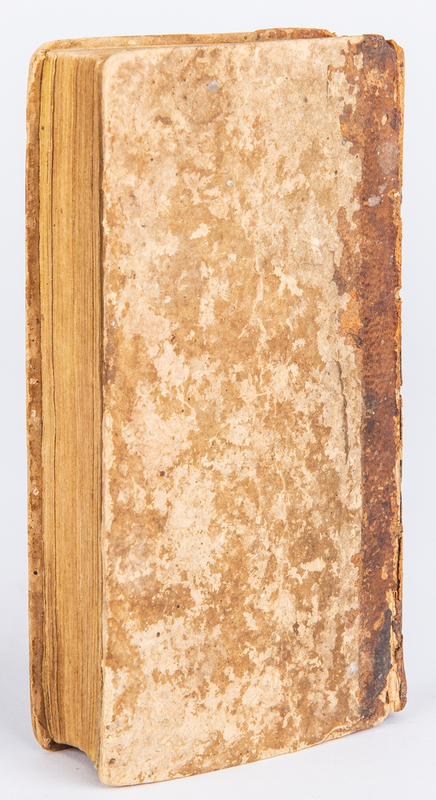 Leather cracked, areas of loss, largest 1/4" x 1/4", to spine. 5/8' x 1/2" areas of insect damage to back end paper. 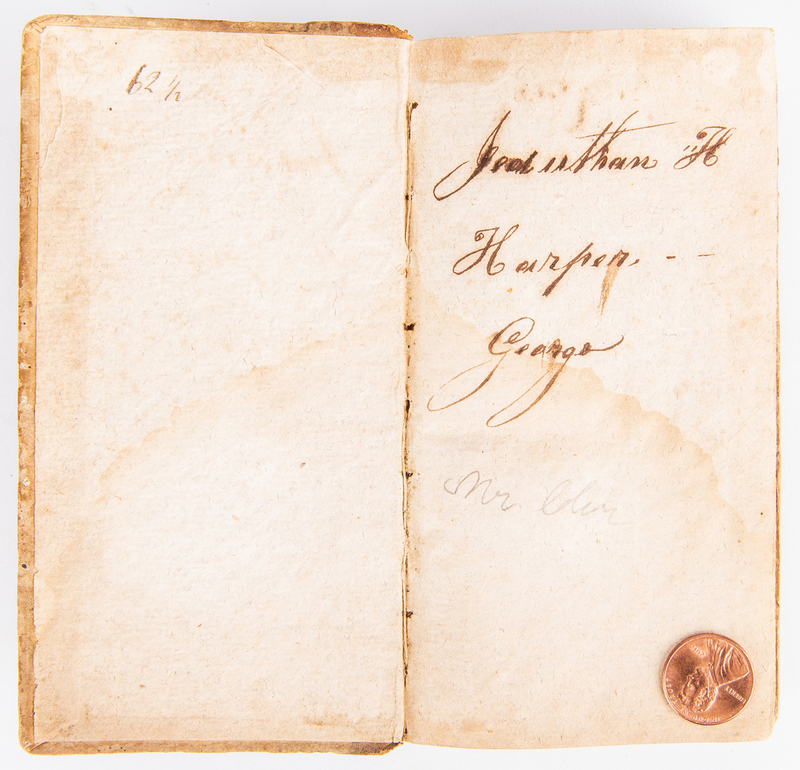 Ink inscriptions from previous owners to inside of front cover and front end paper.